When you are traveling across the country, the terrain doesn't look like a road map so that you know when you have crossed one state's border and ventured into another. Of course, there are those handy "welcome to ___" signs heralding your entrance into new territory, but those are easy to miss as you are barreling down the highway. You are tired, you're hungry, you aim for the nearest interstate exit and you find yourself in a quaint little mom and pop restaurant, but you are asking yourself, "what the heck state is this?" Now I can't help you out with Idaho or Montana, but here are 10 signs you might be eating in Alabama. 1. If the server greets you and calls you honey, darling, sugar or sweetheart, you might be dining in Alabama. But, don't be thinking you are so special. These are terms Alabamians use to greet anyone and everyone, especially when we don't know your real name. Also, if you look a little worn out from your journey, she might say something like, "Well, bless your heart!" This just means she is feeling sorry for your poor, bedraggled self. Conversely, if you are complaining and being obnoxious, she might also say, "Well, bless your heart! ", but the tone will be altogether different. In this instance, she is secretly wondering who your mother is and why she never taught you any manners. 2. If you see grits on the menu, you might be eating in an Alabama establishment. Grits can come with any meal in Alabama. We eat grits with lots of butter and black pepper for breakfast, cheesy or garlicky grits with our barbecue, or topped with spicy shrimp for dinner. 3. If someone offers you boiled peanuts, you might be in Alabama. While not all of us get a kick out of boiled peanuts, there are enough folks in Alabama who do love this soggy treat that the inclusion of them on any menu could be a clue as to your whereabouts. I do not have a picture of boiled peanuts, because I am one of the weirdos who does not eat them, but they were on the menu at Fisher's Dockside Restaurant when I dined there last summer. 3. If your breakfast comes with a cathead biscuit, do not be alarmed. No cats are harmed in the making of these biscuits. Cathead simply means you are not going to get a dainty little biscuit that you can swallow in one bite. A cathead biscuit is the size of a cat's head and we are not talking about kittens here. Cathead biscuits are a clue that you might be in Alabama. 4. Your server might ask you what kind of gravy you would like to have with your cathead biscuit. If your choices are red-eye, sawmill, or chocolate, you might be in Alabama. The red-eye version is made with strong coffee and the drippings from the ham that you might have ordered with your breakfast. The sawmill version will be much lighter in color and is made with milk and the drippings from the sausage you are eating. If you order the chocolate gravy, it will be a lot like having hot fudge sauce poured over your biscuit. 5. If you are in Alabama, cornbread will be somewhere on the menu and it will not be sweet, so don't ask. Asking for sweet cornbread will garner the same reaction my friend, Dede, got when she asked her server if the grouper she ordered would come with its head on. Since groupers can grow upwards of 8 feet long and nearly 800 pounds, her server knew right away she must hail from some land-locked state. She does. When all the snickering cooks in the kitchen stuck their heads out to see who had just asked such a question, she knew she had said the wrong thing. Don't be like Dede. Do not ask for sweet cornbread. 6. 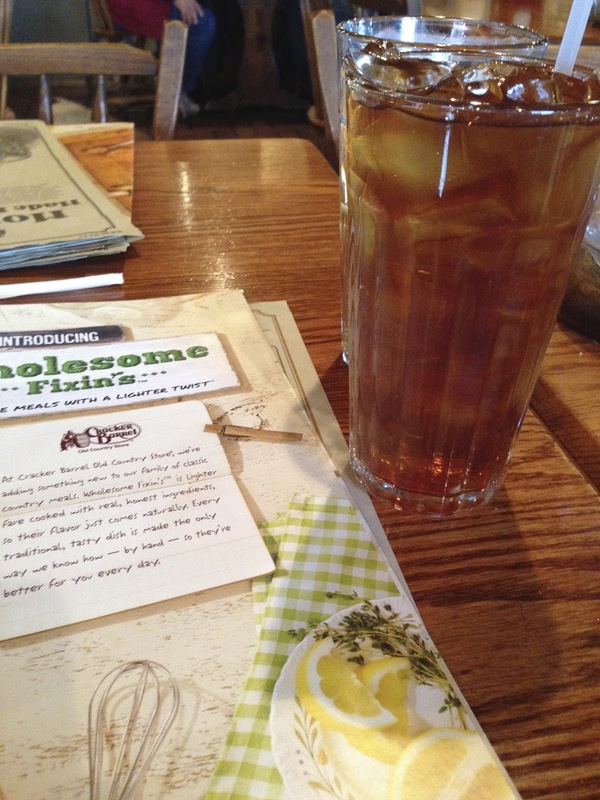 Conversely, in Alabama, your tea will be iced and sweet. Do not ask for hot tea with cream or butter or whatever you foreigners put in those little tea cups. In Alabama, the tea might come in a canning jar or even a gallon sized bucket. It will have ice and lots of it and it will always be sweet. Your server might bring you unsweet tea if you insist, but your heart will definitely get blessed again. 7. Alabama restaurant menus will often include greens. The greens might mean something different than what you are used to. If you are thinking fresh arugula or escarole, think again. The greens will probably be collard greens or turnip greens and they will have been cooked for hours and served in their own pot likker (that is the liquid that results from all that cooking). 8. If you order barbecue, it will likely be pork. This isn't Texas. We like beef, but for the most part, barbecue means pork, unless you specifically ask for barbecued beef, bless your heart. Your Alabama barbecue is likely to come dry, with the sauce on the side and you can ask for inside meat, outside meat or a mixture of the two. You can also ask for extra bark (that means the dark, crunchy crust that forms on the outside of the meat while it is cooking). Also, you might be in Alabama if your barbecue comes with a side of coleslaw or if coleslaw is topping your barbecue sandwich. The coleslaw might be vinegary or mayonnaisy, but it will almost always be there. You know what people will say if you ask for the slaw to be left off. Ummm hmmm. 9. If you order barbecued chicken and it is topped with a white sauce, you are definitely in Alabama. Alabama white sauce almost always comes with barbecued chicken. This tart and creamy sauce is made with a mixture of mayonnaise and vinegar and lots of black pepper. It was invented here and we like it. In fact, we like it so much, we sometimes put it on our barbecued pork. 10. If you order fish in Alabama, unless you happen to be somewhere along our beautiful coast, the fish will likely be catfish. You can get catfish grilled, sautéed, fried, smoked, broiled or blackened. It is delicious. The options for seafood are wide open if you find yourself in one of our beautiful coastal towns. Oysters, shrimp, crab, scallops, crawfish and an endless variety of fish can find their way onto your plate. Lucky you! On the other hand, you will know you are in Alabama if you find yourself eating delicious farm to table creations with Chef Frank Stitt, Chef Chris Hastings, Chef James Boyce, Chef Chris Dupont, Chef Rob McDaniel, Chef David Bancroft, Chef Chris Newsome, Chef Jon Gibson or any of the other wonderful chefs who call Alabama home. That is because Alabama is home to some of the best food and best chefs you will ever encounter. So if you find yourself eating in Alabama, you are very lucky indeed. Finally, you can be sure you are in Alabama if, when you are finished eating, your hostess waves you out the door saying, "Y'all come back now, y'hear!" There you are. 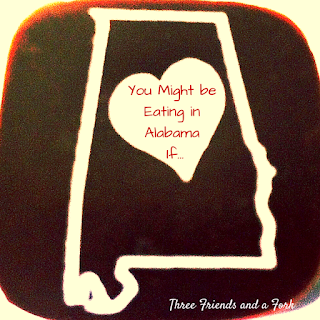 You will definitely know when you cross into Alabama's delicious food territory. Sorry about the other 49 states. You are on your own with those.